In this MPC X & MPC Live tutorial we’ll quickly put together a realistic sounding MPC ‘cycle’ kit that uses round robins to emulate the subtle timbre variations found in acoustic instruments like drums. This tutorial is adapted from my MPC X & MPC Live tutorial book, The MPC X & MPC Live Bible. Consider a drum kit consisting of a kick on pad A01, a snare on pad A02, a closed hat on pad A03 and an open hat on pad A04. 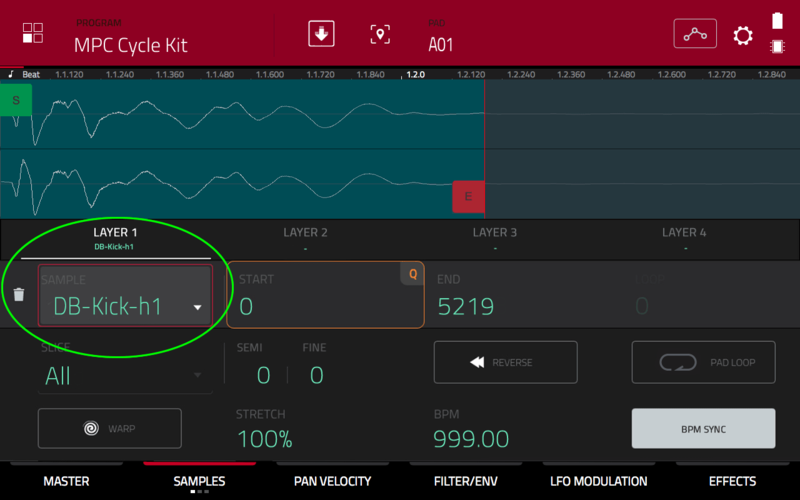 In a basic kit we simply assign a single sample to each pad but this means that each time you, for example, hit the snare pad, it will always sound exactly the same. However in real life the snare would always sound slightly different each time it was hit, that’s just the nature of playing an acoustic instrument – these small changes in timbre can be due to you hitting the snare in a slightly different position or hitting it at a different angle, or not hitting it quite as hard. An MPC ‘cycle kit’ lets us mimic this natural variation in sound by configuring each pad to play back a different ‘variation’ of the instrument each time it is hit, giving us a kit with a much more realistic feel. 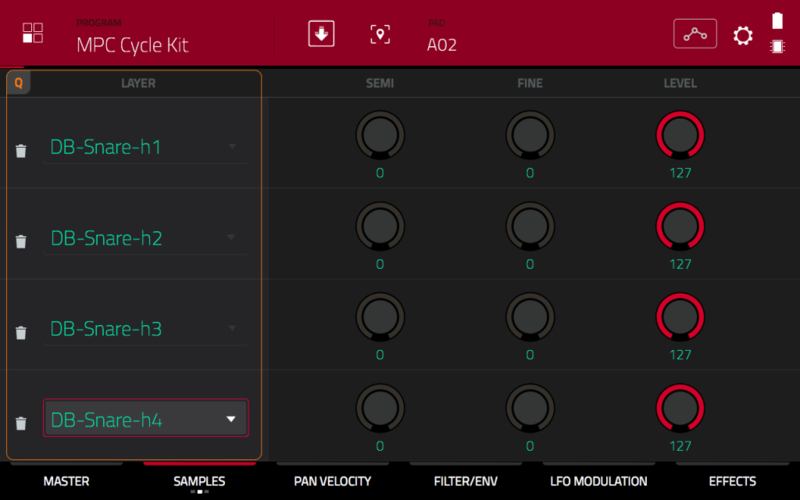 Creating your own cycle kit is really easy; you just need a cool drum break and an MPC. Let’s get building. In order to start building a cycle kit, the first step is to source the drums. We’ll need at least two natural variations of each drum instrument, preferably played at a similar velocity – the more variations we have, the more realistic our kit will sound, however the MPC can only handle a maximum of four variations per pad. You can purchase multisampled drum libraries, but a good way to grab some great sounding drums is to chop them from a great sounding live break! Chopping techniques are beyond the scope of this tutorial, but I cover them all in great detail my MPC X & MPC Live tutorial book. For the purposes of this tutorial I’m going to use a bunch of chops I made using a couple of my favourite Timmy Rickard breaks from his epic ‘Dirty Drum Breaks Vol 1’ collection. You can download everything you need here. Once you’ve downloaded the tutorial files, you’ll need to transfer them to your MPC Live or MPC X. The easiest way to do this is to transfer them to an SD card or USB stick, but you can also copy them to an internal SATA drive if you have one installed. 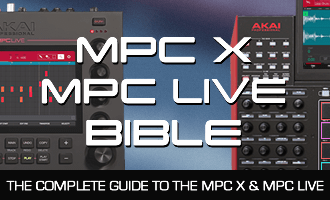 For more information on how to transfer files to your MPC Live or MPC X, check out my ‘MPC Live & MPC X: File Transfers‘ guide over at MPC-Samples.com. The ‘h1’ refers to ‘hard hit 1’. The ‘m1’ refers to ‘medium hit 1’, while ‘s1’ is the ‘soft’ hit. After chopping a break I’ll normally ‘CONVERT’ it using the ‘New program with new samples’ option in SAMPLE EDIT. I’ll then go through each sound and discard the poor quality ones, for example some kicks often have a hi hat playing in the background, but ideally I want ‘pure’, isolated sounds where possible. Also some snares will invariably have little or no decay tail (which can be fixed in a decent audio editor, but that’s perhaps a subject for a future tutorial…). After quality control I’ll then rename the sounds by instrument type (snare, kick, etc) and then use my ears to decide on an approximate velocity to assign to each sample – for this tutorial I just used to hard (H), medium (M) and soft (S), but you could use more granular labelling, including ‘medium soft’, ‘extra hard’ etc. In my multisampled drum kits I’ll often use standard musical dynamic notation (ff, f, mf, mp, p, pp), or you could even use MIDI velocity numbers (127 = hardest, 1=softest) – just chose whatever works best for you. The first step is to set up the bare bones kit layout using just one sample per pad. 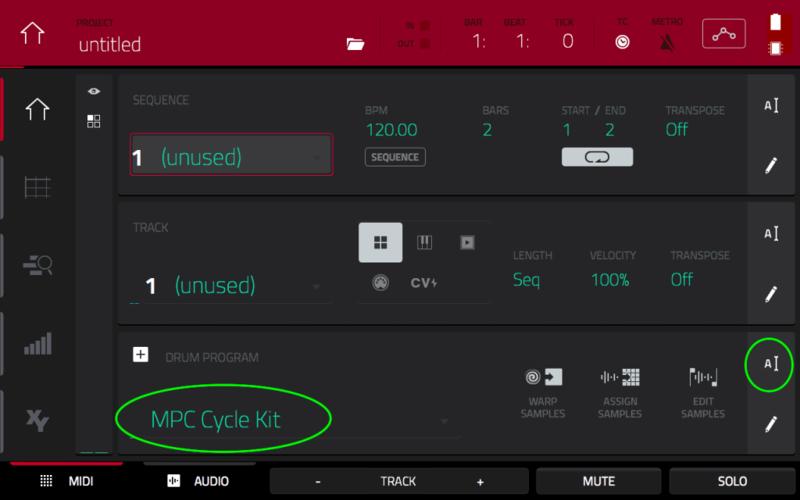 Go to MAIN and hit the ‘A’ end of the DRUM PROGRAM row; give the default DRUM program the name ‘MPC Cycle Kit’. Now go to PROGRAM EDIT > SAMPLES and hit pad A01 to select it. Now, our chopped break has given us lots of drums at varying velocities (i.e. soft, medium and hard) but in a ‘pure’ cycle kit we’ll usually just use the same velocity for each instrument, typically a ‘hard’ hit. Now select pad A02 and assign a ‘hard’ snare; DB-Snare-h1. On pad A03 assign a hard closed hat, DB-Closed Hat-h1 and finally on pad A04 assign a hard open hat, DB-Open Hat-h1. Play the four pads to hear the basic kit in action – it already sounds pretty good, but that’s because we started with a great break! 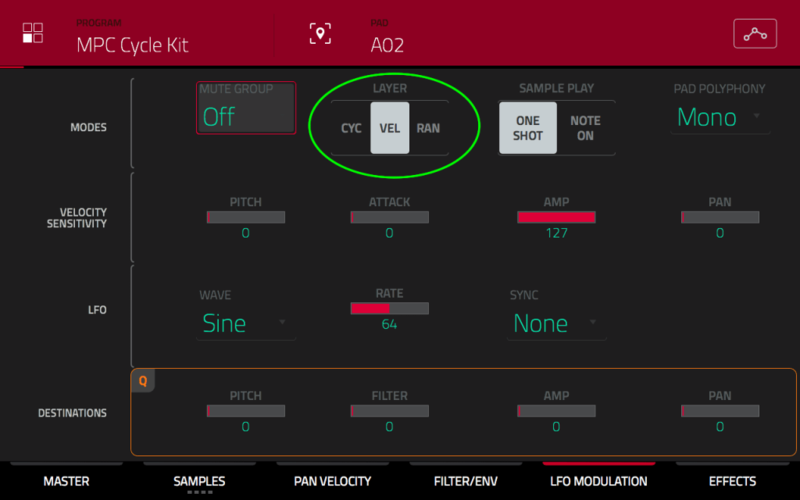 Each pad in an MPC DRUM program consists of 4 unique layers and you can assign a unique sample to each of these layers. By default the layers on a pad are set to play in unison (which is handy for drum layering – see my ‘Clap From Hell tutorial), but we instead set the pad to play the layers in a ‘round robin’. In a ‘round robin’ the MPC will only ever play a single layer each time the pad is hit, however it will be a different layer each time. To set up a round robin we first need to fill some more pad layers with samples. 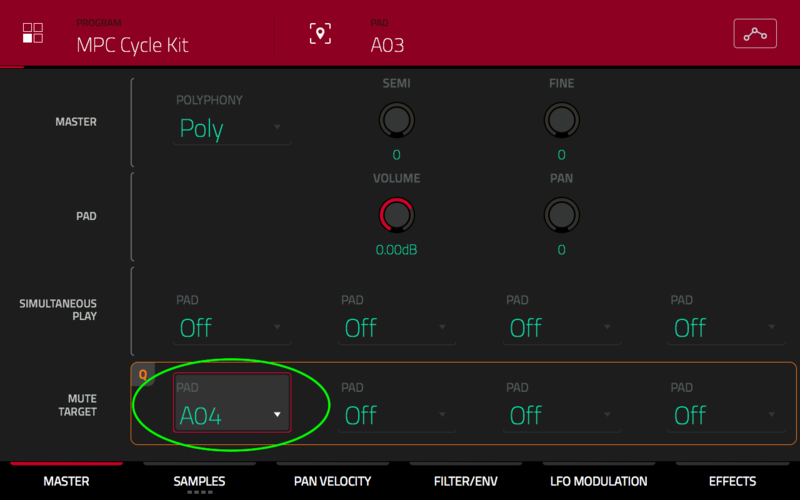 Select pad A02, tap on the LAYER 2 tab assign our second ‘hard’ snare sample DB-Snare-h2. On LAYER 3, assign DB-Snare-h3 and on LAYER 4 assign DB-Snare-h4. 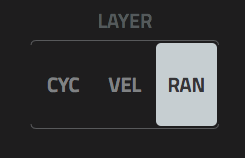 This setting dictates how this pad will handle layer playback. To create a round robin between layers we can choose either CYC or RAN. CYC will play the layers in a ‘cycle’ (hence the name ‘cycle kit’), e.g. the first hit will play layer 1, the second pad hit will play layer 2, and so on. With LAYERS set to RAN, the pad will randomly play one layer from the available pool. Let’s set our snare pad to a ‘cycle’ round robin, so set LAYER for pad A02 to CYC. Now start to continually hit pad A02 and you should hear that each time we hit the pad the snare sounds very slightly different, just like a real snare would sound when hit multiple times in succession. Let’s so the same for the closed hat. 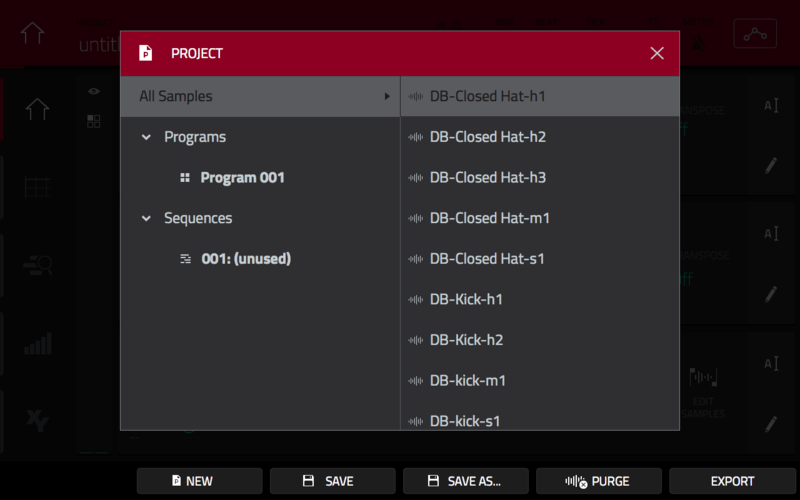 Hit pad A03 and in the SAMPLES screen assign DB-Closed Hat-h2 to LAYER 2 and DB-Closed Hat-h3 to LAYER 3. We don’t have a fourth ‘hard’ closed hat sample, but that’s not a problem as the MPC simply ignores any empty layers when playing a round robin. Head back to the LFO MODULATION screen for pad A03 and this time set LAYER to RAN. Now continually hit pad A03 to hear the ‘random’ round robin in action. Finally set up the kick and open hat in a similar way. The chopped break only gave us two ‘hard’ variations each of these instruments, but that’s still better than using a single sample. Assign the DB-Kick-h2 and DB-Open Hat-h2 samples to LAYER 2 on pads A01 and A04 respectively, and then set your choice of either CYC or RAN. Which round robin setting is best? Generally I prefer RAN although sometimes you will sometimes get the same layer played twice in succession, but I do prefer the pure unpredictability of this option. Finally, go to PROGRAM EDIT > MASTER, select pad A03 and on the MUTE TARGET row, set the first PAD setting to A04 (our open hat). The closed hat on A03 now always ‘mutes’ the open hat on A04, which does a pretty good job of mimicking the way a real hi hat functions. Inside the ‘Cycle Kit Tutorial Files’ folder you’ll find my version of the kit, ‘MPC Cycle Kit Final.xpm’. This is just a basic kit to show you how round robins are set up but we can make a pretty amazing ‘finger drumming kit’ by combining round robins with ‘dynamic switching’, velocity sensitive envelopes, drum layering, effects, LFOs and filters, and I cover all these techniques and more in my complete hands-on MPC X/MPC Live tutorial guide, ‘The MPC X & MPC Live Bible’. Thank you, i’ll definitely be investing in the MPC Bible.